"The secret of life? The secret's in the sauce." 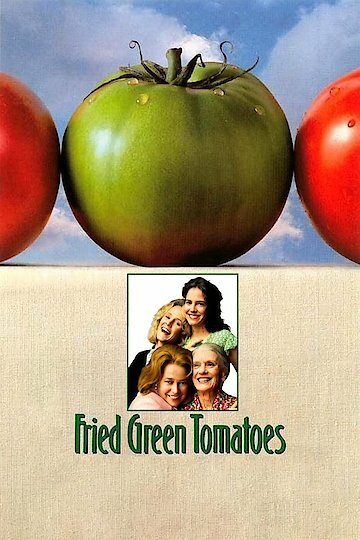 Fried Green Tomatoes is about two depression-era women from Alabama and their close friendship and how it parallels and touches the life of Evelyn, a 1980's timid, unhappy and dissatisfied housewife. Evelyn meets Ninny, an elderly woman in a nursing home. Their friendship begins to blossom when Ninny tells Evelyn the story of Idgie and Ruth, who once owned the Whistle-Stop Cafe. Evelyn looks forward to hearing more about the girls and the Whistle-Stop. As their friendship grows, Evelyn changes from being timid, unhappy and dissatisfied with her life and marriage, to gaining a new confidence in herself, by thriving on the motherly friendship of Ninny and her stories of Idgie and Ruth. She changes her appearance through dieting, exercise, new clothes and a new zest for life. Ninny, the elderly woman, in turn, is offered a permanent home with Evelyn, who has become more like a daughter to her. Ninny tells about the good times and the hardships Idgie and Ruth had to face. Beginning with the death of Idgie’s brother, Ruth's abusive marriage, her son’s accident and finally Ruth’s death of cancer. Through it all, Idgie and Ruth were always there for each other. Ninny reveals an incident that happened at the Whistle-Stop. All was not as it had seemed. Ruth's abusive husband came looking for her and their child at the cafe. He is never seen again. Investigations are made as to his whereabouts and Idgie is charged with murder because she had once threatened violence against Frank for being abusive to Ruth. Although Ninny does not reveal much about herself, the elderly woman tells Evelyn she had been married and raised a boy with special needs who had died. Ninny is well enough to go home with Evelyn. We see in the closing scenes Ninny and Evelyn walking past what used to be the Whistle Stop Cafe, with their arms around each other. Fried Green Tomatoes is currently available to watch and stream, download, buy on demand at Showtime, Starz, Amazon, Vudu, Google Play, FandangoNow, iTunes, YouTube VOD online.